Nonlinear 2-photon excitation is based on the simultaneous absorption of two photons. Since the energy of a photon is inversely proportional to its wavelength, the two absorbed photons must have a wavelength which is about twice that for one-photon excitation. In 2-photon microscopy, two excitation photons from a pulsed laser (Ti:sapphire laser) are combined to excite a fluorescent molecule. The molecule then emits a photon in the visible wavelength. 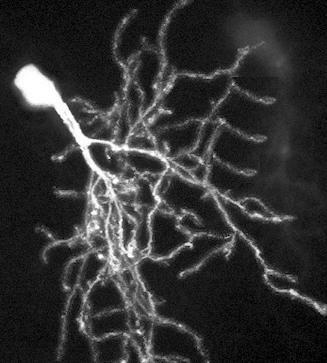 2-photon microscopy allows for out-of-focus background rejection similar to confocal microscopy. The advantage of 2-photon microscopy over confocal microscopy is that it can penetrate deeper into tissue due to absence of out-of-focus absorption, the longer excitation wavelength and less scattered light. Nevertheless the achieved optical resolution is the same for both techniques. SETA BioMedicals has developed several green, red and NIR emitting dyes (probes and labels) with excellent 2-photon action cross sections. Due to the donor-acceptor-donor structure of squaraine dyes they exhibit much higher 2-photon absorption (2PA) efficiencies in comparison with other dyes [22-24] and in particular the new class of squaraine-rotaxanes show extremly high two-photon action cross-sections (2PACS) of up to 10,000 GM at near-infrared wavelengths critical for in vivo imaging. Dyes and labels that undergo two-photon absorption (2PA) in the NIR and fluoresce in the far-red to NIR region with high quantum yields are very desirable to achieve deep tissue imaging. While the 2PACSs of common fluorephores are in the order of 10 - 200 GM (2PACS of the di-anioic form of fluorescein in water at pH 13 is 37 GM and for Rhodamine B the 2PACS is 204 GM for excitation at 830 nm in MeOH - see table below) and even some of the best 2P labels published have 2PACSs of only several hundred GM , Seta and SeTau dyes have 2PACSs in the order of thousand to several thousand GM in aquous solution. 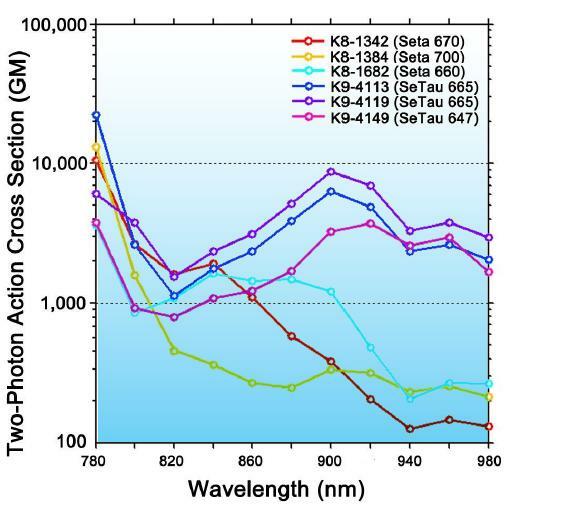 SeTau and Seta labels are the best 2P probes and labels currently available on the market combining high sensitivity and extremely high 2PACS: (K. Podgorski et al. Ultra-bright and -stable red and NIR squaraine fluorophores for in vivo two-photon imaging. PLoS One. 2012; 7(12): e51980). The outstanding imaging properties of SeTau 647 are mentioned in the publication by the group of Prof. Weissleder at the Harvard Medical School: "Here we present the first generation of two-photon beta cell specific in vivo imaging probes based on GLP1R targeting peptides. Among the three compounds of potential interest, we found quite unexpectedly that a squaraine-rotaxane conjugate (2PEx-647, K9-4148) had near ideal in vivo imaging characteristics. The relevant 2PA wavelengths for several Seta and SeTau dyes are provided in the table below. SETA BioMedicals has developed several 2P probes and labels with extremely high 2PACSs and emission wavelengths between 500 and 700 nm. Seta-660, Seta-670 and in particular the squaraine rotaxanes (SeTau-665 and SeTau-647) are currently the most efficient 2P dyes available for the far red and NIR spectral emission range. SeTau-405 with good 2P excitation properties is a dye with fluorescein emission characteristics. The 2P absorption wavelengths and cross-sections for these dyes are provided in the table below. Seta and Squaraine rotaxane dyes offer unprecedented properties ideal for in vivo two-photon imaging. These dyes have two-photon cross-sections and photostabilities approaching those of quantum dots, but with molecular weights similar to other organic dyes, allowing labeling of subcellular structures, such as synapses, at low concentrations and with reduced functional impact. Importantly they are non-toxic and allow long-term neuronal imaging. The demonstrated brightness and stability of these dyes promise to extend the limits of fluorophore concentration, imaging rate, illumination depth, and imaging duration for in vivo two-photon microscopy . 2P-FRET microscopy has significant advantages over laser confocal FRET microscopy: while in confocal FRET microscopy the actual FRET signal in the acceptor channel is always contaminated due to direct excitation of the acceptor molecule and the cross-talk between donor and acceptor emissions in the acceptor channel, in 2P-microscopy it is possible to prevent the direct excitation of the acceptor molecule. 2P-microscopy also avoids out-of-focus bleaching which allows repeated scanning in multiple focal planes and to obtain a more detailed picture of intracellular events. 2P-FRET microscopy is also a powerful tool to assay intracellular protein-protein co-localization/interaction events.